With his struggles worrying a fanbase, and the team's lack of interesting product on ice, it can lead one to wonder whether or not a shake up is needed. If so, is that shake up traded the Captain and face of the NHL, Sidney Crosby? How is this really a question? The entire team outside of Malkin, Kessel, and Fleury are struggling so let's trade our best player! That's the dumbest idea ever. He's been a consistent force for ten years in the NHL. He's 28. He's in his prime. This is an outlier. Or just be a panicky dolt who overlooks the problems with the blueline and the issues with the coaching staff. Nope! 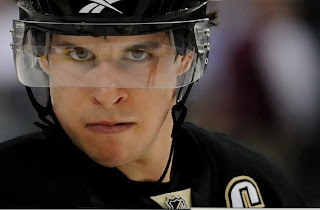 Trading Sidney FREAKIN' Crosby will solve EVERYTHING! Let's do the dumb thing! Yeah! Remember when you wanted to trade Sergei Gonchar and Paul Martin in their first year? Remember when you wanted to trade Fleury for pennies on the dollar? Remember when you thought firing Bylsma and Shero would solve every problem? He's the team captain. He's led the Penguins to two Cup Finals. He's having a bad year. He's earned the right to work it out. No one should be happy with how the Penguins are playing. When Mike Johnston said that the Penguins are in the entertainment business, guess what? No one is entertained. This is boring, horrible, beer league level hockey. No one looks on the same page. Heads will need to roll if this keeps up, and possibly sooner than later. You're a fool if you believe Sidney Crosby's head is one that needs to go. I don't think he's been the "face of the NHL" for a while now...that would require a legit deep playoff run in recent history. However, you are correct, trading Sidney Crosby would be a huge mistake. In essence it would signify giving up and rebuilding, not a shake up.